PROVIDENCE, RI -- We can officially close the books on the 5th season of the Eastern Hockey League (EHL). 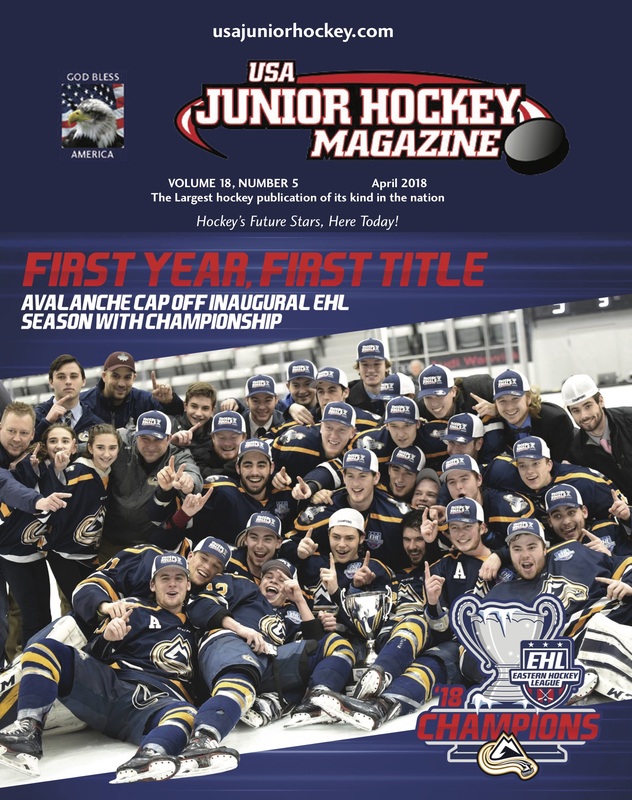 Following an incredible four days at Schneider Arena on the campus of Providence College, the EHL crowned the New Hampshire Avalanche as the newest set of EHL Champions. The Avalanche showed their depth during the three-day Round Robin, and then capped things off with a win over the Philadelphia Revolution in the EHL Championship Game. This year’s EHL Frozen Finals were a phenomenal display of some of the talent that the league has to offer. They were also a final exclamation point on a milestone season for the league. "We just had such a great group of guys," said Avalanche head coach and general manager Chris Cerrella. "It took us a little bit to get going, as we obviously didn't have any returning players. We had to recruit very hard to put this group together, and they deserve everything that they earned. They all worked very hard this season, and it was a great battle here in Providence. I want to make sure we give plenty of credit to the Revolution, Little Flyers, and Rangers. Those are some great organizations from the top on down, and this was a great tournament." When the four teams arrived at Schneider Arena, they all did so with high hopes set on leaving Providence as EHL Champions. The field was as even as possible, and that was proven through a league poll taken prior to the start of the tournament. 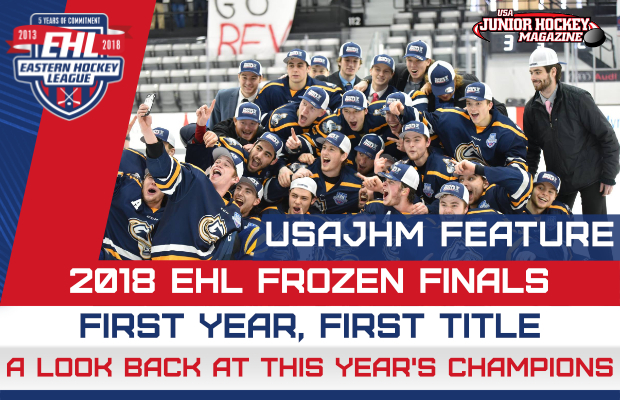 The question was simple, “What team is going to win the EHL Frozen Finals?” This question was asked to the 12 teams that didn’t advance to Providence, and all four finalists received three votes apiece. Now that’s an even playing field. The action got underway with the matchup of conference champions as the top team for the North, the New Hampshire Avalanche, took on the top team from the South in the Philadelphia Revolution. After the two teams exchanged goals in the 1st period, the Avalanche grabbed the only tally in the 2nd period, as well as in the 3rd period, on their way to a 3-1 victory to kick-off the tournament. Flipping over to the night cap, as the matchup between the Philadelphia Little Flyers and Boston Jr. Rangers started the same exact way. Following the first 20 minutes, the Rangers-Little Flyers game took on a different pattern. The Rangers put home both goals that were scored in the 2nd period, and then the Little Flyers followed suit in the 3rd. Heading into overtime locked up at 3-3, it only took Eric Higgins a 1:09 to find the back of the net, off of a great feed from Alex Ochterbeck. The comeback was complete, with a big 4-3 win for the Little Flyers. At the end of the Day #1 – Avalanche (2 Points), Little Flyers (2 Points), Rangers (1 Point), and Revolution (0 Points). The second day of action brought with it another pair of non-conference matchups, starting once again with the Regular Season Champions, the Revolution. For as disappointing as their loss was to the Avalanche on Day #1, their game with the Rangers was just the opposite. The Revolution controlled the play throughout in this one, on their way to a 4-0 victory. Travis Pelke anchored his team with a 30-save shutout between the pipes. In the second game, the two winners from Thursday faced-off in an entertaining battle of speed and skill. The Little Flyers scored a pair of power-play goals in the 1st period, and that proved to be just enough, as they held off the Avalanche for a narrow 2-1 victory. At the end of the Day #2 – Little Flyers (4 Points), Avalanche (2 Points), Revolution (2 Points), and Rangers (1 Point). Heading into the final day, it appeared as if the Little Flyers and Avalanche were in the most control of their own destiny, but all four teams did own at least a chance to advance to the EHL Championship Game. By saving the conference matchups for the final day of the Round Robin, it was only fitting that a pair of rivalry games would help determine which two teams advanced for a chance at the title. The day began with the Little Flyers vs. Revolution, as the Philadelphia rivals hit the ice both with high hopes of advancing to Sunday. For the Little Flyers a win or an overtime loss punched their ticket, while the Revolution needed to win the game in regulation, and they had to do so by a decent margin. The Revolution went out and did just that, as they controlled the play in very similar fashion to the way they did against Rangers on Friday. An even one goal per period plus 30 more saves from Pelke, pushed the Revolution into the EHL Championship Game with a 3-0 shutout win over the Little Flyers. With one team’s ticket secured for the Championship Game, the North Conference showdown was set to determine the Revolution’s opponent. Unfortunately for the Rangers, the loss of the Little Flyers to start the day eliminated them from contention, but regardless the Avalanche offense came to life on Saturday afternoon. A total of seven goals from seven different players led New Hampshire into the Championship Game with a 7-4 victory over the Rangers. At the end of the Day #3 – Avalanche (4 Points – Ticket Punched), Revolution (4 Points – Ticket Punched), Little Flyers (4 Points – Eliminated), and Rangers (1 Point – Eliminated). With three teams tied at four points apiece, the first tiebreaker of head-to-head was a wash as all three teams owned records of 1-1-0 against each other. As for the second tiebreaker, the Avalanche and Revolution owned greater goal differentials helping to punch their respective tickets to the Championship Game. Heading into the EHL Championship Game, there was only one question that remained to be answered, “Could the Avalanche maintain their perfect record against the Revolution?” After knocking off the Revolution twice in the regular season, New Hampshire moved to a perfect 3-0-0 against Philadelphia with their win on Day #1 of the Round Robin. The fourth and final victory was no doubt going to be the hardest one to claim. The physical matchup began with a quick goal for the Avalanche, as A.J. Prystawski found the back of the net less than a minute into the action. Not long after, Derek Tillotson put home his own rebound, and the Avalanche took a 2-0 lead into the break. It was clear how critical the next goal would be and New Hampshire got that one as well, just under eight minutes into the middle frame. With the momentum heavily tilted in favor of the Avalanche, Brian Lange got the Revolution on the board with 2:51 remaining in the 2nd period, and the stage was set for a big 3rd period and final frame. As the final frame began, Philadelphia had hopes of striking quickly, therefore giving themselves more time to even up the hockey game. Unfortunately for Philadelphia, a phenomenal defensive effort from the Avalanche kept them off the board again until there was just 28 seconds left. In the final moments, a Christian Dahl shot was blocked by the facemask of Christopher Adamsons, and the Avalanche had held on for a 3-2 victory. When you look at Cerrella's roster from the 2017-18 season, it's filled with talented players. With 18 NCAA Commitments and counting, the veteran head coach has crossed off the main goal of helping advance his players to the next level, and now the championship win serves as the icing on the cake. Mario Martiniello is the Owner of the franchise, and he also is as the team's Assistant Coach. He took some time to reflect on this group of young men, and the memories that they now have for the rest of their lives. "We knew from the get go that we had a solid team, but it took us fighting through some adversity during the season to find out who we really were," said Martiniello. "A big reason for this victory was our depth. We used 24 of 25 players during the finals, and everybody pushed each other every day. We rolled through all four of our lines and weren't afraid to send out any of our defensemen. We had the two goalies split the games here in Providence, and at the end of the day, I feel like we were the only team with enough in the tank to finish the deal." 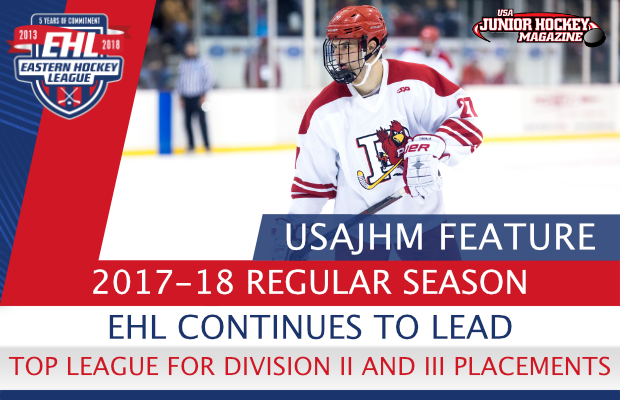 In a milestone year for the EHL, a new franchise came in and stole the show on their way to winning the #Eshow Championship. Congratulations to the New Hampshire Avalanche. We're ready for the 2018-19 season.